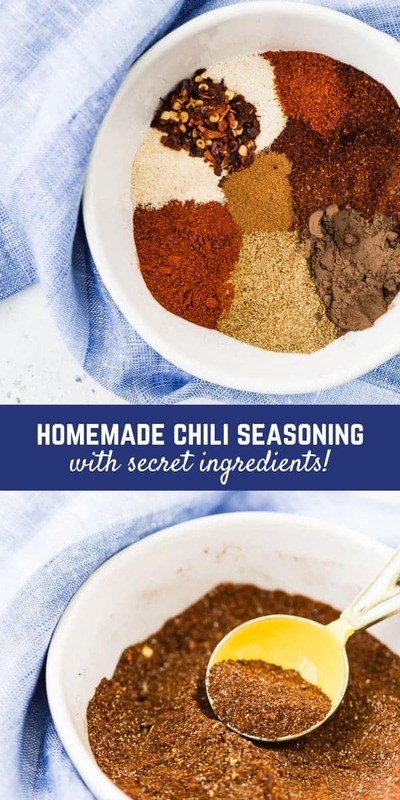 This chili seasoning recipe is a perfect blend to have in your cupboard for when you want to make a quick pot of chili. There are a couple surprises that set this spice mix apart! You guys. It’s snowing in Michigan right now. I’m not talking a few little flurries snowing. I’m talking scrape off the car, shovel the driveway, salt the porch, put up the Christmas tree snowing. I’ve lived in Michigan my whole life, and yet snow in April never ceases to annoy me a little bit. Our plants were all starting to pop up, and now they’re covered with snow. I debated not writing this post, because frankly, I just don’t really feel like doing much of anything at all. I just want to curl up under a blanket and watch movies. The kids are grumpy, I’m a little grumpy (okay, fine, a lot grumpy), and we’re all just over it. Alright I’ll be honest, I wrote those first few paragraphs and then decided to push this back a day. Sunday was a long day, my kids were so grumpy, and by the time they went to bed, I was completely spent. I could have done it, of course, but I decided to give myself a break and relax a little before bed instead of working late. So, instead of writing, I laid in my bed, ate popcorn, and watched Schitt’s Creek. I’ve heard everyone raving about it recently, and I have to admit, it is pretty funny. I am excited to share this chili seasoning with you, though. 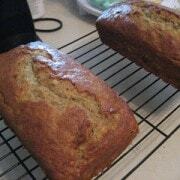 It’s a recipe that a couple of readers have requested over the years, so I’m excited to finally share it. Trust me, and make it as it is written. Either way, your call. This is a no-judgement zone. Okay, so what is in this chili seasoning mix? Chili Powder, and lots of it. 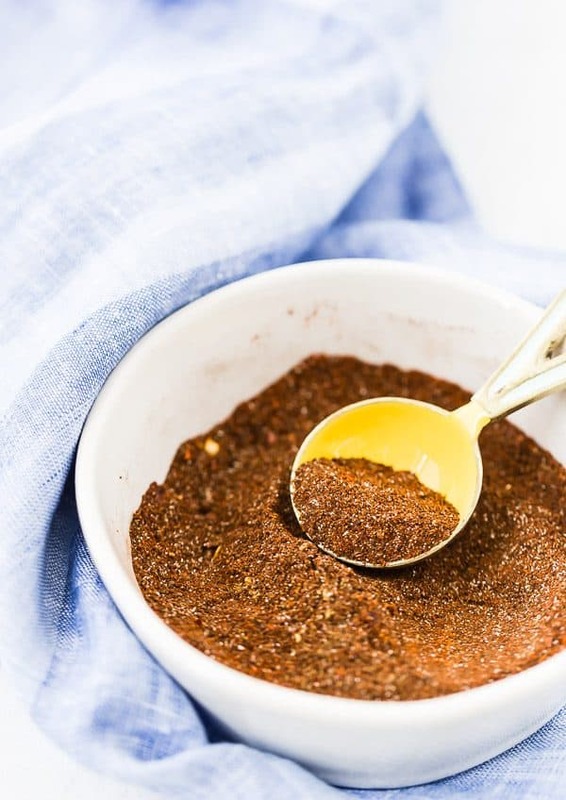 The cinnamon and cocoa powder might sound strange at first glance, but they add a great depth of flavor that sets this apart from typical store-bought seasoning mixes. You’ll also notice a few omissions that are often found in store-bought spice mixes. I leave the salt out of my spice mix for a couple of reasons. The first being that I like to add the salt (and pepper, but that’s next) when I’m sautéing my vegetables and cooking my meat. I also want you guys to be able to control the amount of salt you put into your chili. Add a little while you sauté your vegetables and meat…and then when it is all said and done, give it a taste and add more as needed. Where is the ground black pepper? Again, I like to add this while I sauté my vegetables and meat. I find it’s the best time to layer in this flavor. I don’t go heavy on the black pepper when I’m using this spice mix, though, because it already has red pepper flakes and cayenne. I also often add diced jalapeño to my chili (my favorite chili recipe is coming to you this week!) so I don’t find that a lot of black pepper is needed. Many store-bought seasoning mixes contain some sort of thickener. I like to add masa at the end, but some people like a thinner chili, or they might just use less liquid to begin with. Again, I want you to be able to control this aspect of your chili, which is why I didn’t include it in the seasoning mix. 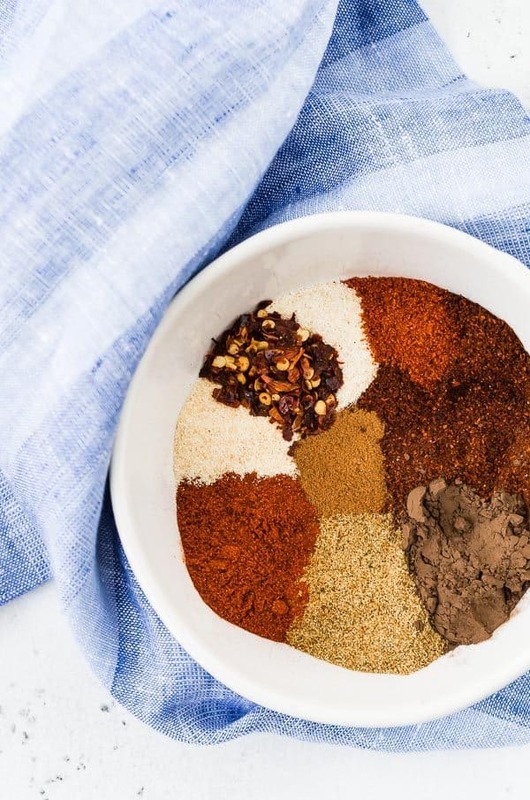 Taco Seasoning – My #1 go-to, always. 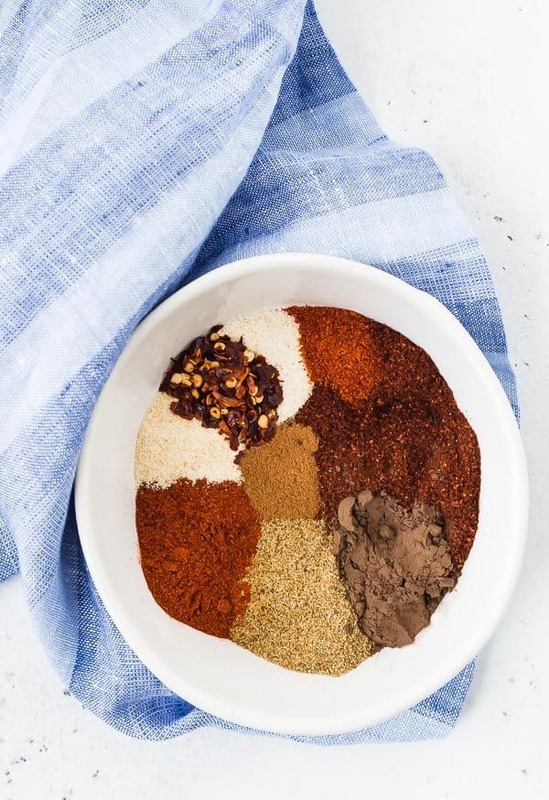 Pumpkin Pie Spice Mix – Good for so many things, not just pie. 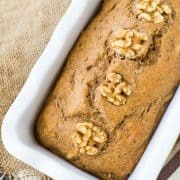 This pumpkin spice candied walnuts are to die for! Fajita Seasoning – I use this one all the time, especially in sheet pan chicken fajitas. Mild Curry Powder – I love this one! It’s great in this copycat Panera squash soup or pumpkin curry soup. 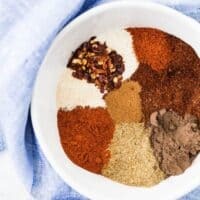 Beef Stew Seasoning Mix – Great in Instant Pot Beef Stew! We adore chili with cornbread. Try this healthy cornbread, cornbread muffins with herbs and cheddar, or these bakery-style corn muffins from Peas & Crayons. This chili seasoning recipe is a perfect blend to have on hand when you want to make chili. 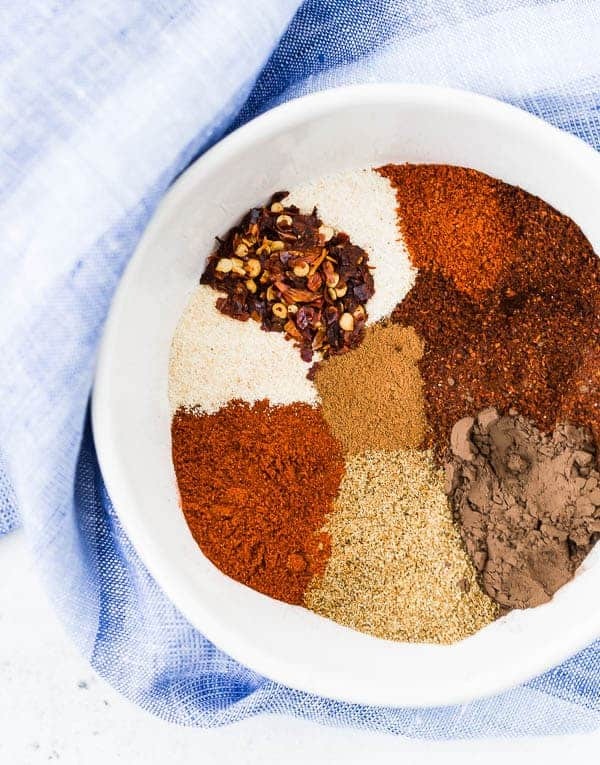 There are a couple surprises that set this spice mix apart! Mix all ingredients together in a small bowl or jar. Store in a small airtight container. After cooking meat and vegetables for chili, stir in spice mix and toast for 1-2 minutes before adding liquid ingredients to chili. I use this entire spice mix with 3 pounds of meat in a beanless chili. Since each chili recipe is different, it's hard to say exactly how much to use. Start with half if you're unsure, and you can always add more. Verdict: I love the flavors in this chili seasoning, and I know you’re going to, too! Husband’s take: Well, it’s not like he ate a spoonful of this seasoning, but he loves the chili I make with it. Changes I would make: None are necessary! BUT you’re the boss of your kitchen! Want it smokey? Use smoked paprika instead of sweet paprika. Want it less spicy? Reduce or eliminate the red pepper flakes and/or cayenne. Want it a little sweet? Add some dark brown sugar. Cinnamon too weird for you? Well, I think you should try it, but like I said…this is a no judgement zone. I have used cinnamon and cocoa in my chili, too. 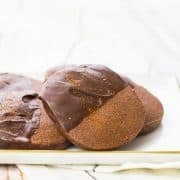 Cocoa gives it a bit of a mole` flavor. It does! It just really makes it taste so much richer and more flavorful.